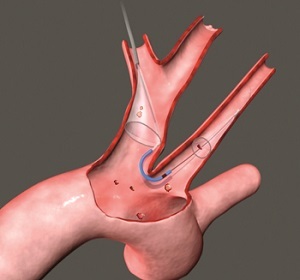 Patients who might benefit from a heart valve replacement but are too ill for open heart surgery can sometimes undergo a less invasive procedure known as transcatheter aortic valve implantation or "TAVI". About 10% of patients undergoing TAVI can experience small strokes and related brain injury as a complication. A new study found that the use of a cerebral protection device, which captures debris dislodged from blood vessels during the TAVI procedure, reduced the number and volume of brain lesions seen on MRI. Researchers from the University of Leipzig Heart Center, Germany studied 100 patients with an average age of 80 who underwent TAVI. 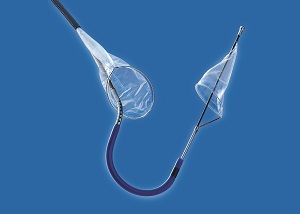 Half of the patients received the cerebral protection device and the other half did not. Patients underwent brain MRIs before the implantation and again at 2 and at 7 days after the procedure. The results found that using the filter device helped to decrease the number of brain lesions seen in the brain by about half.